The most consistently shocking label this year does it again with a killer 12" from Transition's LD. Following in the wake of his superb collaboration with Kode 9 on 'Bad', LD is afforded a whole 12" to himself with the stunning late night burner 'Traumatic Times' backed with the ravier 'Woodblock'. We went weak in the head when we heard Oneman drop 'Traumatic Times' on his Rinse show recently, initially mistaking it for a new Mala production, which is forgiveable as it bears some resemblance to his 'Alicia' rmx, but the deep set subbass roll and effervescent glow of the production could only come from the man who has cleaned up more dubstep than anyone else in the game. 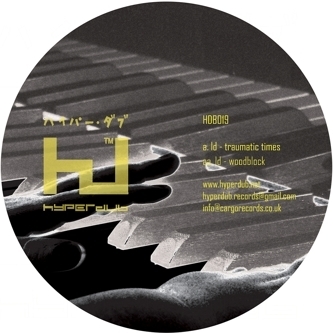 'Woodblock' on the flipside is a tougher rave burner, reminding us strongly of D1's recent styles with a technofied edge lurking in the rippling machine rhythms and insistent rave riff. It's almost impossible not to love this twelve as LD's productions only seem to get more refined, lush and deadly with every new step. Hugely Recommended!